Although credit card debt can represent one of the most expensive ways to borrow money, the numbers show that Americans are relying more and more on this plastic form of financing. The average American household carries an alarming $8,284 in credit card debt, according to a recent study released by WalletHub. Even more disturbing than this sizable number is the fact that this study also finds many Americans are hardly managing their credit card debt effectively. The study suggests that the average household is a mere $177 away from a credit card debt burden that would be unsustainable, based upon income. This is a textbook example of living at the outermost boundary of your financial means. 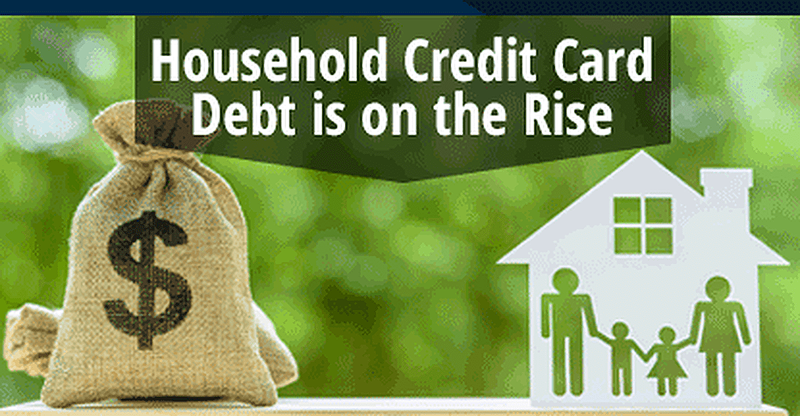 You may wonder why credit card debt is on the rise in the midst of recent economic growth. In its most recent report, the Bureau of Economic Analysis estimates that the country enjoyed a 3.5% increase in real gross domestic product (GDP) in the third quarter of 2018. GDP is a measure of the size of the economy. Unemployment is way down and incomes are rising. So why are we taking on more unsustainable credit card debt? Of course, there’s no simple way to answer that question because we all make financial decisions based on our own variables. Nonetheless, here are a few possible explanations as to why average household credit card debt has grown despite a strengthening American economy. More consumers have access to credit cards: A TransUnion study reveals that over 171 million consumers had access to a bank card at the end of the first quarter of 2017. If that number seems high to you, it’s because it is. It represents the highest level of credit card access for Americans in almost 15 years — since 2005 to be exact. Wages have not kept up with purchasing power: Pew Research reports that, despite economic growth and lower unemployment rates, wage growth in the United States has lagged. The report goes on to claim that the average wage in America has roughly the same purchasing power it did 40 years ago. It’s hard to pay down credit card debt when you have less disposable income. If you are one of the many Americans currently sitting on a pile of credit card debt, it’s time to not only admit that you have a problem, but also to resolve to do something about it. Even if you believe you have your monthly payments under control right now, you may be just one missed paycheck away from a serious mess. Assuming you aren’t in the position to simply write a big check and pay off your outstanding credit card debt all at once, here are a few smart strategies that may help you begin driving your debt toward zero dollars. How much do you owe? Many people only have a vague idea of the total amount of credit card debt they carry. Yet if you’re serious about saying goodbye to your credit card debt for good, it’s crucial to confront your credit card problem head-on. First things first, you need to find out the exact dollar amount you owe on each credit card. List each of your credit card balances on a spreadsheet, app, or even a piece of paper. It can also be a good idea to search through your statements and identify where you are spending your money. If you discover you’re charging $2,000 per month dining out, for example, that may be an area where you need to cut back. Following a budget is about as fun as visiting your dentist, but, like seeing a dentist, it’s a necessary evil. Excessive credit card debt generally happens when you spend more than you earn on a consistent, monthly basis. Overhauling your budget or perhaps even creating a budget in the first place can be a powerful tool to help you break the overspending habit. A budget is a smart idea regardless of your income. Whether you earn a little or a lot, you’ll never get ahead if you spend more than you earn. As the old saying goes, if you don’t tell your money where to go, you’ll wonder where it went. Once you’ve updated your budget, you’ll be ready to create your payoff plan. It’s usually a wise idea to channel as much available income as possible into eliminating your credit card debt given how expensive it is to maintain. The average credit card interest rate is between 17% and 19%, whereas retail store cards carry interest rates as high as 29.99%. The average interest rate on a general use credit card, depending on who you believe, is somewhere between 17% and 19%. For retail store credit cards, the average interest rate is well into the 20% range or more. Start by listing your credit card balances from the largest to the smallest. Then, funnel as much money as you can each month toward paying off the credit card with the smallest balance. Don’t forget to make at least your minimum monthly payment on all of your credit cards at the same time or you could damage your credit scores. Once you’ve paid off the account with the smallest balance, move up the list and repeat the process. Paying off your credit card debt using this “snowball” method can both (a) give your credit scores a potential boost and (b) keep you motivated when you’re able to cross another credit card off your list. In addition to the strategies above, you may be able to supercharge your debt-payoff plan and speed up your progress by incorporating a few of the following ideas. It’s wise to stop using your credit cards while you’re trying to pay off the balances, however, you shouldn’t close the accounts. Closing an account may lower your credit scores. Carrying or “revolving” outstanding credit card balances from month to month is not only expensive, but it can also inflict damage on your credit scores. Credit card balances that are too close to your credit limits can damage your scores even if you never miss a single payment on any account. If you’re currently carrying more credit card debt than you can afford to pay off, you need to stop overspending and make a plan to reverse the damage sooner rather than later. Remember, your credit card debt is only truly “under control” when you can afford to pay your balance in full every month. John Ulzheimer is an expert on credit reporting, credit scoring, and identity theft. The author of four books on the subject, Ulzheimer has been featured thousands of times in media outlets including the Wall Street Journal, NBC Nightly News, New York Times, CNBC, and countless others. With 27 years of credit related professional experience, including with both Equifax and FICO, Ulzheimer is the only recognized credit expert who actually comes from the credit industry. He has been an expert witness in over 325 credit-related lawsuits and has been qualified to testify in both federal and state courts on the topic of consumer credit. In his hometown of Atlanta, Ulzheimer is a frequent guest lecturer at the University of Georgia and Emory University's School of Law.